September 3, 2012  Boxed wine suffers a reputation for being cheap and generally lousy. Plus, a box can't really compete visually with a sleek glass bottle. So a Swedish company has reshaped the box into a purse, for easy transport and improved lines. August 9, 2012  The canned beer revolution is well under way, led by craft breweries that have adopted a cans-are-better philosophy and are winning over beer snobs nationwide. Now, cans are coming to even the tiniest microbreweries, thanks to mobile canning services. 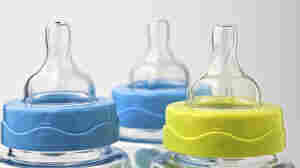 July 17, 2012  Years after chemical companies stop using BPA in baby bottles and sippy cups, the Food and Drug Administration announces a ban. But consumer groups say FDA should do more and ban BPA from all food containers.